The University of Missouri is committed to providing its students with the knowledge, skills and attitudes expected of informed and responsible citizens. 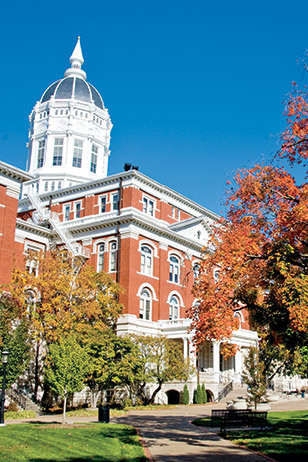 Graduates of MU must be able to understand complex issues that go beyond their academic field. Proficiency in writing, speaking, mathematics, computer use and information management. Increased understanding of the nature of knowledge and the ways of thinking in the social and behavioral sciences, physical and biological sciences, and humanities. An appreciation of the fine arts. Knowledge to improve critical and analytical thinking. An understanding of our culture and history. Students must complete the general education requirements. With careful planning, some courses may be chosen to meet both University general education requirements and one or more of the divisional, degree and major requirements. Students are strongly encouraged (and in some divisions required) to meet with an academic adviser in his/her field to ensure adequate progress towards the selected degree and major. For some divisions, courses listed at this site do not count, or count differently. Check with your adviser to make sure this course works for your program before you enroll in a class.